Huawei has been in the smartphone market for years, producing smartphones for Orange such as the Orange Barcelona and 3G dongles for various networks. After a string of impressive budget models including the Huawei Ascend G300, the Huawei Ascend P1 is a sign of the move to the high-end market (sitting behind the flagship Huawei Ascend D Quad) where Apple and Samsung rule, and Sony and LG are approaching fast. The big question is, can Huwaei compete with the big boys? The Huawei Ascend P1 looks like a budget smartphone. The plastic body and shiny casing is solid but a world apart from an iPhone 4S and Sony Xperia S. Unlike cheaper Huwaei efforts however, the battery is sealed inside the body with the SIM card slot on top of the phone and a MicroSD slot just below the power button on the right hand edge. The camera looks cheap too - a hefty flash and lens is housed around an unappealing bump on the reverse of the smartphone. It's not a dealbreaker but against rivals, it looks like an unfortunate wart on the face of gadget desperately trying to become a super model. A dual-core 1.5 Ghz processor and 8 Megapixel camera are expected at this price point as is Android 4.0, out of the box. Happily, they're all included - the camera has an HDR function and the sound has Dolby tech built-in. The Dolby tech isn't something you'll notice every day and is perhaps included as a riposte to HTC and Beats tech in HTC smartphones. The promised 'theatre like' sound depends on the quality of your headphones of course and you're going to need to spend over £100 to hear much difference in audio playback and, even then, it may not be your preference. The 4GB of internal memory is poor for the price point - MicroSD expansion is cheap but for the price tag, you should expect a minimum of 16GB and the 32GB that rivals offer. 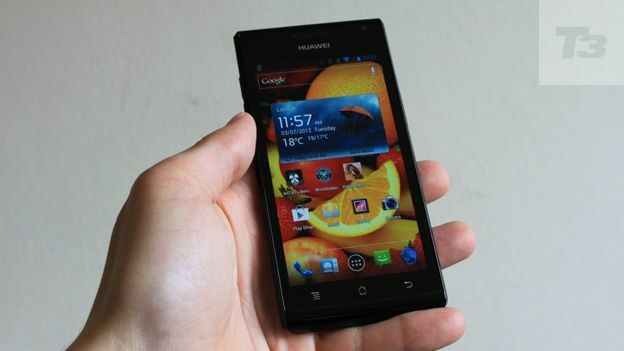 The screen is one area where the Huawei Ascend P1 does a good job - it's a 4.3 display with a 256 pixels per inch density. As an example of how far Huawei has come, the Samsung Galaxy S3 clocks in at 320 ppi and the iPhone 4S at 326 ppi. It's a bright, responsive Super AMOLED touchscreen with tough Gorilla Glass casing which compliments the rugged feel of the smartphone. The standard brightness setting isn't quite up to daylight viewing - we needed to tweak the settings - and the viewing angles aren't great but overall, it's a good screen and the best part of the Huawei Ascend P1 overall. The dual-core A9 processor is fast and capable at 1.5 Ghz and ran all apps and games tested without issue - menu speed can actually be too fast at times thanks to the slick interface. Using the Antutu benchmark app, the Huawei Ascend D received a 6108 score, impressive but behind the Sony Xperia S at 6502. Ultimately, the processor works well with the camera autofocus, quick to recognise close-up objects and with a delay of just half a second when taking a photo. The camera is good in daylight, suffering a little in darker conditions. Video is more impressive and there's a typically average front facing camera for Skype. The 1670 mAh battery is average in terms of size - the Sony Xperia S manages a bigger battery for a smaller screen but the Huawei Ascend P1 managed a day of use with the brightness level set above the out of the box setting. Huawei is still living in the land of the budget smartphone. The specs may be impressive but there's compromise at every corner, most noticeable in the build quality. If LG can build better looking phones for £99, Huawei should take note. Using the Huawei Ascend P1 for calls, we found the glossy finish made the smartphone difficult to handle and had a tendency to slide against the ear.